In the summer of 1997, I had the opportunity to accompany Father John A. Hardon S.J., to Washington D.C. to meet with Mother Teresa, and later in November, to Calcutta, two months after Mother Teresa entered into eternity. Father Hardon had been teaching the Missionaries of Charity since the beginning of his association with Mother Teresa, and the teaching trip to the motherhouse in Calcutta had been a yearly event. However, this 1997 trip was somehow very special. It was after the death of Mother Teresa, and it was the longest trip, nearly six weeks, compared to the usual one or two weeks, and was very providential, since it was Father Hardon’s last trip to Calcutta. The retreat lasted nearly two weeks, with three conferences per day and private conferences and confessions. Father held four classes a day, Monday through Saturday, for the remainder of his stay. Such a vigorous schedule would be more than demanding on a person in good health, so considering Father Hardon’s ill health, it was a miracle … as if he was being “powered by grace” (a saying used by his Detroit office workers). The amount of teaching Father Hardon transmitted over this six-week period was extraordinary. The privilege of being with Father, and watching the Sisters going about their work were spiritually uplifting. Through the subsequent years, I have come to realize how much the spirituality of Mother Teresa and her Sisters has influenced my life, and how much it can benefit the Marian Catechists. The Sisters always make their Holy Hour, regardless of their busy schedule in serving the poorest of the poor. As Mother Teresa described it, the Holy Hour is the time for their daily family prayer. They gather together and vocally pray the Rosary during the first half-hour. The second half-hour is in silence. Mother knew adoration of the Blessed Sacrament to be the source of grace to sustain the miraculous growth of vocations in her order. Mother Teresa’s deep faith in the Real Presence was the foundation of her mission to the poorest of the poor. Her love for the poor came from the same love she had for Our Lord in the Holy Eucharist. Without that faith in the Real Presence, there would not have been a Mother Teresa. When we touch a sick person or a needy person, we are touching the suffering body of Jesus Christ. The poor, in whatever part of the world they are to be found, are the suffering Christ. In them, lives and dies, the Son of God. Through them, God shows us His face. We must not serve the poor as if they were Jesus. We must serve them because they are Jesus. 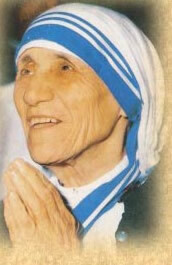 His Holiness Pope John Paul II asked Mother Teresa to change the Constitutions of the Missionaries of Charity. He wanted the Missionaries of Charity to become missionaries of not only poor bodies, but also of poor souls. I will give saints to Mother Church. Father Hardon was known to spend much of his time on the phone helping others. The phone in his office rang unceasingly, and to the point that he was not able to write as much as he would have liked. We all know how important his writing was to him. Despite all the efforts by his Detroit office staff to limit his telephone conference hours, I can say that we were not very successful. Invariably, he would order us to activate the ringer outside his phone conference hours, and he would personally pick up that phone when it rang. For many years I pondered why Father Hardon permitted so much of his work to be left unfinished by interruptions which I considered frivolous. He always gave his attention to the souls that God had put in front of him. He placed these souls ahead of his work. Recently, a good friend and fellow Marian Catechist told me “I understand why. It was because Father was so detached from his work – a true sign of holiness!” He took care of the souls God put in his life, and let God take care of his work. Faith in action is love. Love in action is service. What Mother meant by “Christ is walking through the world in you and through you” was that we are to be channels of grace. The only way for a catechist to teach charity, is to practice charity. This is what Father Hardon called the “iron law of spiritual reproductivity.” Only like reproduces like. We are to be the conduit of divine grace to produce loving Christians, but only to the degree that we are personally living loving Christian lives. To give saints to Mother Church, is to put our faith in action. This is Christian love. To put Christian love in action is to give service to those souls that God places in our lives.